Edibles are an increasingly popular way to enjoy cannabis. There are good reasons why. With this method of intake, cannabinoids are processed by your digestive system. Although this means the high can take an hour or two to set in, once it does, you'll really feel it. That's because eating cannabis releases the cannabinoids over a longer timeframe. You could be looking at highs lasting between 4–10 hours, marked by stronger, groggier effects. Inhaling cannabis smoke through your lungs provides a quicker high, but comes with its downsides. It could be doing damage to your lungs, and its smell could be attracting unwanted attention. You must try a cannabis edible if you haven't already. There's no better place to start than with the classic weed brownie. This is how many a newcomer first encounter cannabis edibles. I mean, why wouldn't a chocolate brownie be the first recipe that occurred to people? 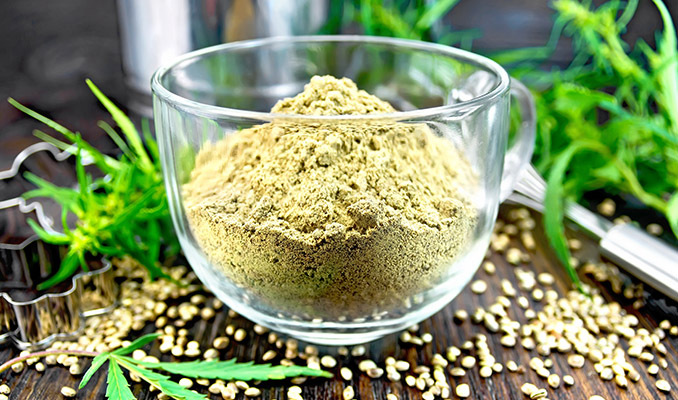 Okay, technically, the Indian drink “bhang” could be THE first recipe that occurred to people. But in terms of modern confectionery, chocolate brownies are just so damn tasty, especially with some vanilla ice cream. In theory, once you have infused fat with cannabis, you can cook it as part of any recipe. Stroganoff. Carbonara. Beshbarmak. In Cambodian restaurants, they sell cannabis-infused "happy pizza". Whatever you can imagine, really. Brownies are great to start with because they have such an easy recipe to master. Brownie mixes in stores tend to have easy-to-follow instructions. Here, we like to put a bit more effort into a top-notch, freshly-made recipe. We're here to talk you through our preferred recipe for brownies to get you blazed. First, we'll explain how to make "cannabutter", which you can then add to this or any other recipe. Preheat your oven to 115°C (240°F). Grind up your weed as finely as you can, but not into a powder. Your brownies will be stronger depending on the potency of your strain and how much you use in this recipe. Proceed cautiously if it is your first time. Spread the ground-up weed over grease paper on a cookie sheet and bake in the oven for 50 minutes. Check regularly that it is not burning to a crisp. Give it a good turn about half way through. This heating process will decarboxylate the cannabis so that it releases chemicals efficiently when cooked in fat. Place ½ cup (115g) of butter in a medium saucepan. Fill the saucepan with water until the butter can float. Add your newly decarboxylated cannabis to the mixture. Simmer this mixture over low heat. Technically one hour is enough for some impact to be felt. Simmering for between 2–4 hours is said to make the infusion more potent. Some people simmer for longer than that. Just remember to keep the heat low, otherwise you will degrade the cannabinoids. When you finish simmering, strain the mixture through a fine-mesh sieve or cheesecloth into a cup or bowl. The soggy lumps of cannabis can be thrown out. Leave the water/butter mixture in the fridge to cool overnight. The butter should rise to the surface and form a hardened layer. Chip this off and you have your "cannabutter" ready for your recipe. It is also advisable to have one small bar of high-quality chocolate on hand. Either dark, milk, or white. Or one of each if you like. If you can, cut these up into chocolate chips and sprinkle them in before loading your batter into the baking pan. For one thing, it will make it tastier, but there's also a practical advantage. The more fat there is in your edible, the more cannabinoids it will store. That's how the edible high works in the first place, by storing chemicals in the fat of your body tissue. So adding more pieces of chocolate could boost the potency of your high. You can also add walnuts or macadamias if you're one of those freaks who likes nuts in their brownies. Just know that this is in the same league as putting pineapple on pizza. Preheat your oven to 180°C (355°F). Mix all your ingredients together, except the eggs. Add the cannabutter. It is optional to add the leftover cannabis water. Start stirring vigorously with a large spoon or electric stirrer. Keep stirring until a thick batter forms. Now's the time to add in your chocolate chips/chunks. Spread this batter evenly in a baking pan. Bake in the oven for 20–30 minutes, being careful not to overcook. When the brownies are cooked and cooled, enjoy them in moderation.